The account of Jon's ascent of Kilimanjaro is now on sale at all main Waterstones Bookshops. Priced at only £9.95 with a foreword written by Sir Chris Bonington the book charts the teams attempt to put Jon Amos, one of Britains leading wheelchair athletes on the summit of Africa's highest peak. 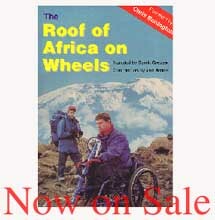 You can buy The Roof of Africa on Wheels online now.